I was so impressed the first time I discovered embroidery hoop art. I thought: What an economical way to create a work of art. 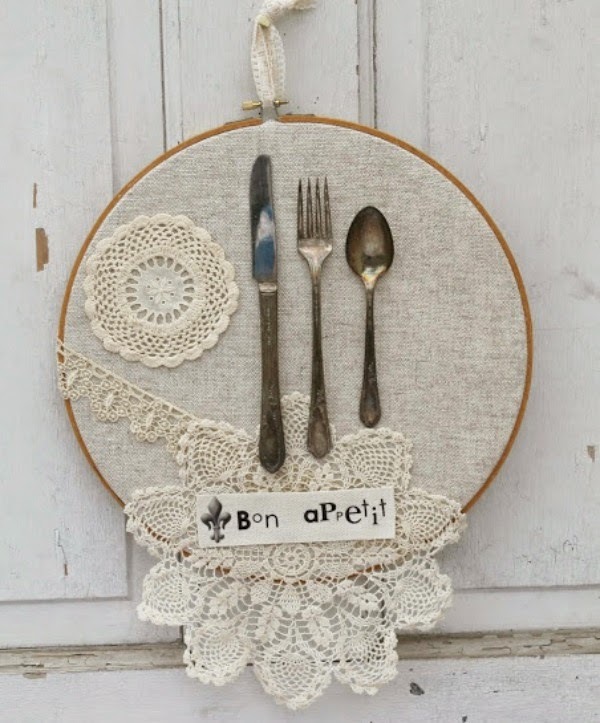 How did it take so long for we lovers of sewing and embroidery to come up with this fun and pretty idea? 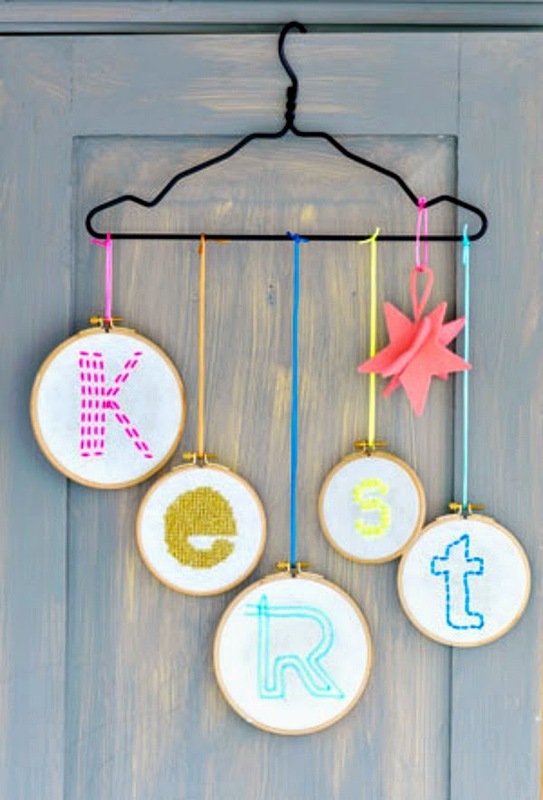 Embroidery hoop art is a super easy way to create wall art. I love how they’ve made a sort of gallery of embroidery hoop art in the photo above. The possibilities are absolutely endless. Just look at this vintage beauty. 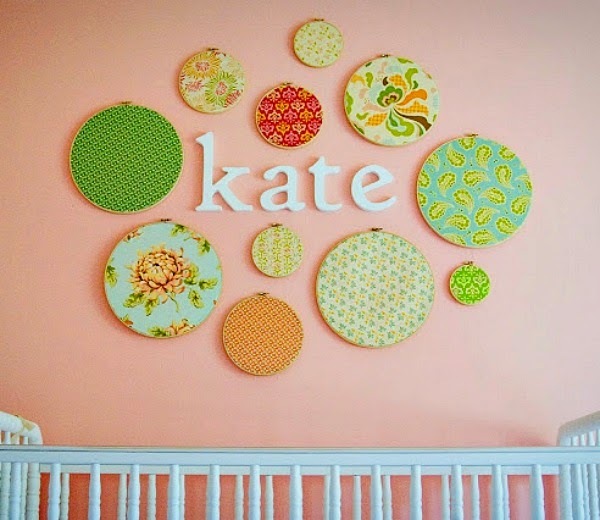 It’s a very frugal way to decorate a nursery wall, for instance. 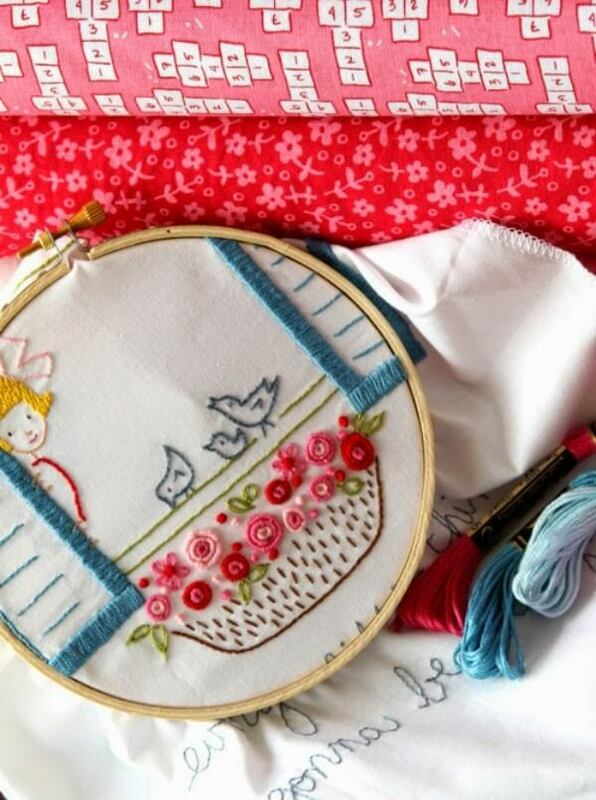 You can even create a mobile with an embroidery hoop! It’s fun to test our embroidery skills on a small project. I learned how to embroider in the early nineties and was instantly smitten. The pretty colors of embroidery floss were cheap to buy and add to my stash. The many stitches I learned stayed with me. I have a book showing those stitches around here somewhere I think. The one above is embellished with many elements. It is fun and different. I love the quote added. 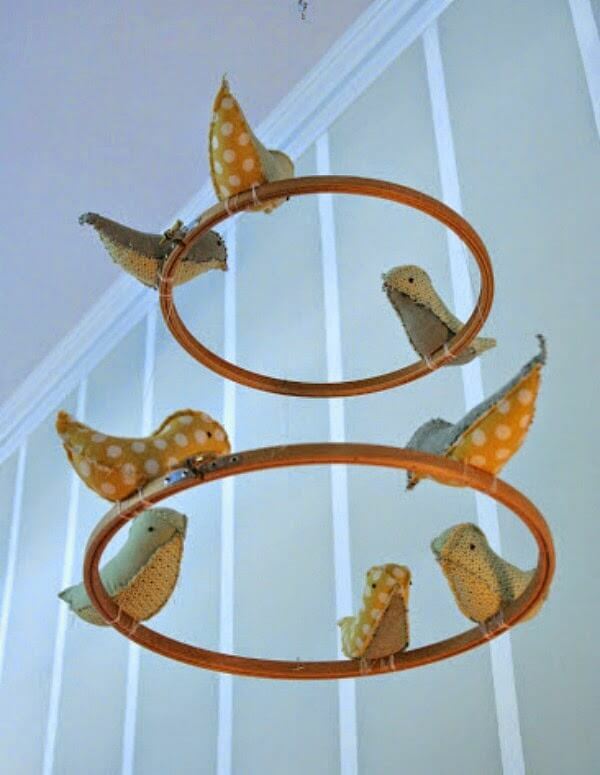 Or make this hoop art the theme for a party. 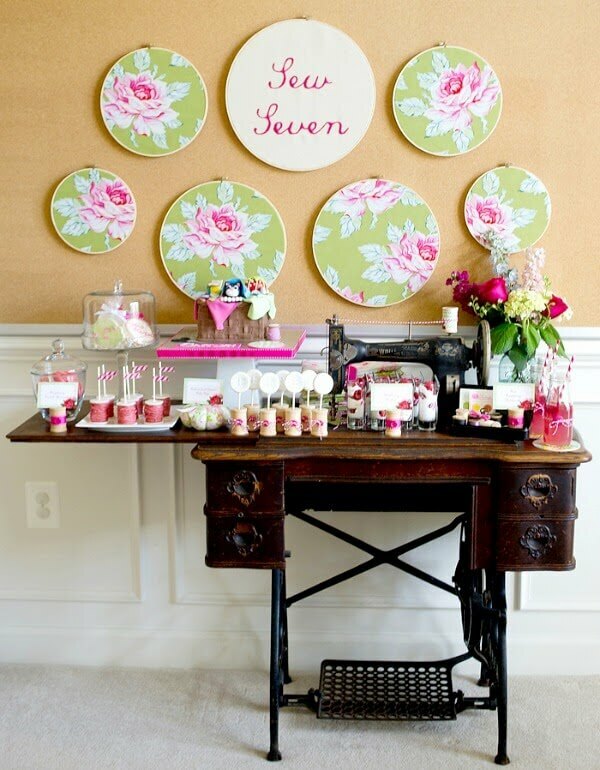 This is such a great way to use a sewing machine as the backdrop for the festivities. 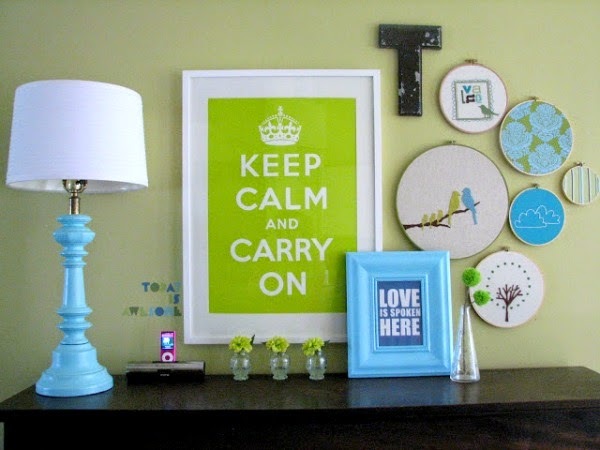 The embroidery hoop art above on the wall is just the icing on the cake. 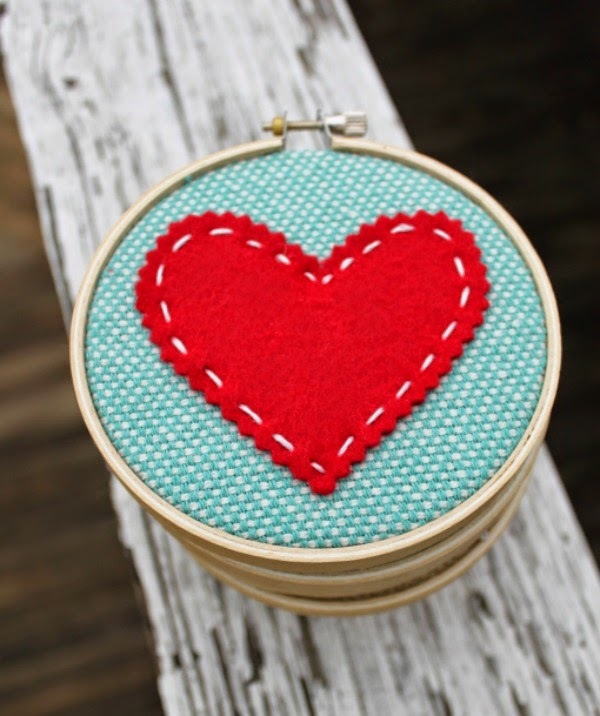 A simple heart hoop would be perfect for Valentine’s Day. 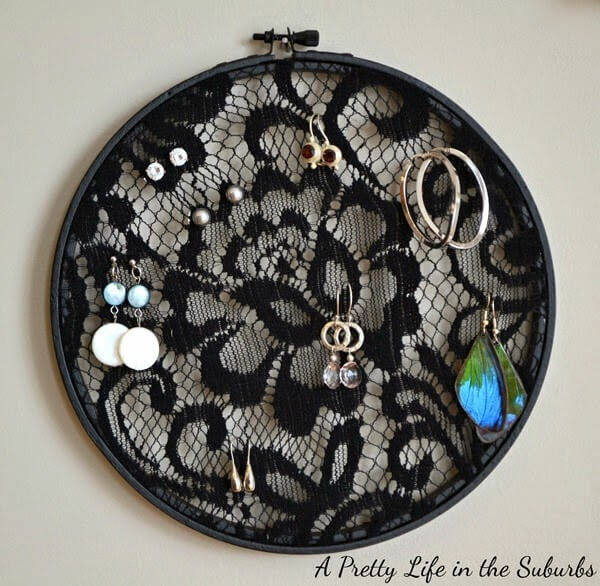 You can even use an embroidery hoop taut with lace as an earring holder. Or you could spell out someone’s name. The project above revolves around a color theme. Love it. 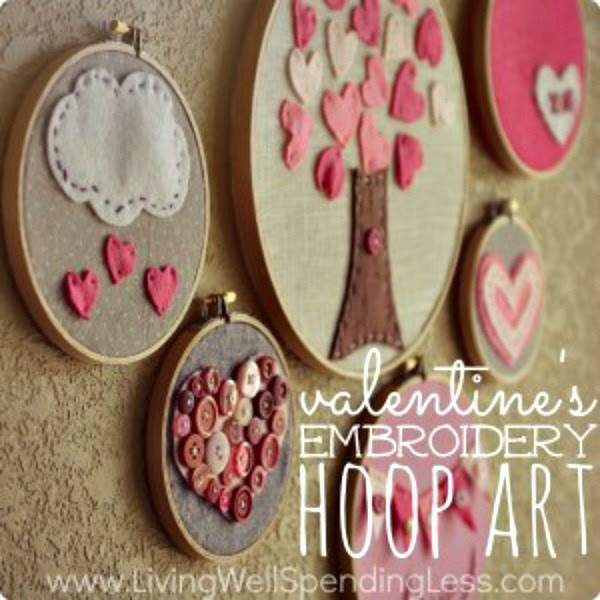 Have you ever made embroidery hoop art? I want to make more of these easy crafts soon myself. Lovely inspiration and ideas-thanks Brenda! Embroidery hoops have certainly taken on a new life. There are a couple of ideas I might just try. Never made one but I think they are so pretty!! Some cute ideas there! I still have the Irish Prayer to finish embroidering, I'm ashamed to say. Learned the art of embroidery as a child. I'm sure many kids today have no idea what it is! These are all cute…my favorite, though it is hard to pick one, is the birds-mobile. 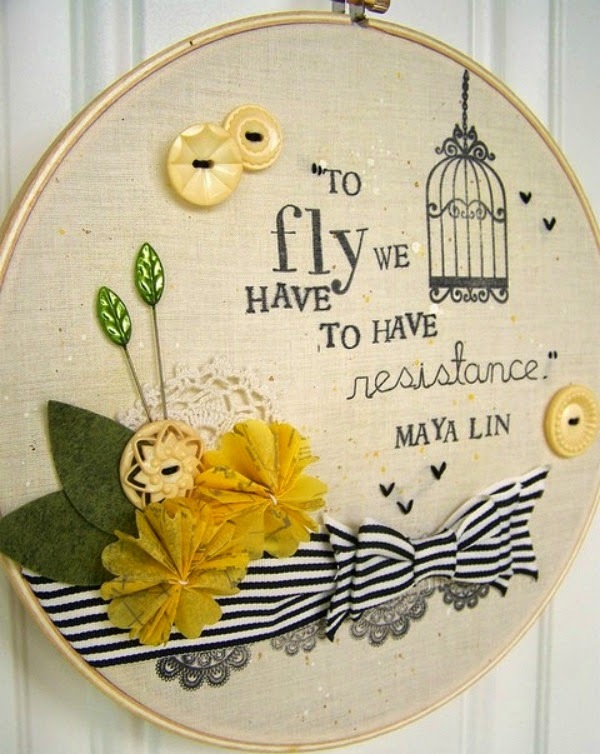 I love embroidery hoop art too! I made some with different, but coordinating, fabrics to hang on the wall in my daughter's little fort under the stairs. Brenda, It's a cold and snowy Sunday evening here in Colorado. I picked up my copy of the July 2014 Country Sampler magazine, which I had not got around to reading yet, in spite of having it on my mental list of intentions to read. I was delighted to come across the article with pictures from your home, and doubly pleased to see that you are a blogger. I have reviewed this blog and the one with blogger helps and decided to subscribe. Your decorating style is fun and cheerful. 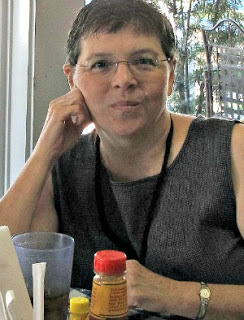 Your clever frugality and organization is fascinating. I look forward to seeing your future posts. Thank you for sharing yourself with us. Oh one more thing, I love how you phrased it, "This place is for women who circle the wagons to help one another. Who are always there, in good times and in bad." I remember when embroidery hoops were popular 20 or so years ago. It's nice to see them making an appearance again. I'm glad I saved a few! Yes, about 25 years ago I was making appliqued geese and putting them in hoops. It was a very affordable way to decorate my home. I love the images you shared, Brenda! Lots of great ideas! I love hoop art. I have some, but nothing fancy, just some different material in each one to go with the decor. I do love these ideas. My cousin who is 32 came to visit this past July and she asked me, what is with all these hoops? I told her to ask her mother who is 62, she would remember from the 70's. Ha Ha. Funny how things come full circle over and over. No pun intended. tiffany engagement rings sale Why tiffany london sale help me. Aguang not suddenly find themselves uncomfortable stomach, back to the past seems to really feel the chill of the abdomen actually disappeared. tiffany uk sale This tiffany engagement rings sale is how it was. Because I put your knife broke, I do not want to tiffany london sale accompany you a dollar. cheap laugh.